Get ready for camp. What to pack. “That One Thing”-Lucky bandanna, t-shirt, or van mascot. This item is that one thing you’ve taken to camp every year and have found some awesome use for in a pinch. For me, my one thing is music. When people are getting rowdy I throw on some music and it usually unifies us and organizes some of the energy. Double Stuff Oreos. If they aren’t double, don’t bring them. It’s against the law. Sharpies. Don’t plan on bringing them home. Tape & Scissors. Girls always need this stuff. I can almost set an alarm for the first requests…three minutes after move-in. Work Out Clothes. These will never get used but at least you made the effort. An Entourage. Never, I repeat NEVER, go to camp alone. Bring your best adult leaders, train them, set them loose to have fun and share the week. It’ll change everyone’s experience–the more you have, the more you’ll thrive. Resources. Take your “go-to” help resources for students who will be struggling. A good study Bible, The book, “Helping Teenagers In Crisis“, and if you have access to the internet–a laptop or iPad–it’s great to be able to show a teenager things they can get involved in or be a part of right away. A Piece of Home. Bring something that reminds you of where you’re from and from what you lead out of. Sometime throughout the week, you will have an opportunity to minister to someone because of who you are, who you were, and who you want to be. Don’t hide out trying to be something you’re not. Be yourself and you’ll be seen as real and be able to connect in relevant ways. Read. 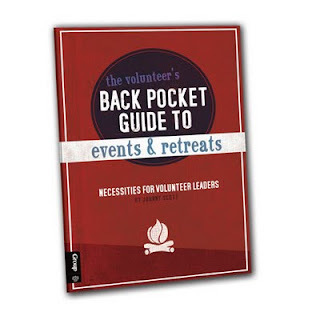 “The Volunteer’s Back Pocket Guide to Events & Retreats: Necessities for Volunteer Leaders” By Johnny Scott and talk it over with your leaders before you leave. I love the chapter, “Things your youth pastor wants to tell you but doesn’t have the time…or the guts!” It’s amazing. Pick it up asap. There are other things, you know, thinks like deodorant. But you get the big picture. Plan ahead and you’ll have a great week. Meaningful, memorable, and life-changing. So, I’m heading off to camp…I’ll let you know how many Oreos we pounded if you promise to post your top camp gear! Have a great summer.